Spot cotton quotations were 153 points lower than the previous week, according to the USDA, Agricultural Marketing Service’s Cotton and Tobacco Program. Quotations for the base quality of cotton (color 41, leaf 4, staple 34, mike 35-36 and 43-49, strength 27.0-28.9, uniformity 81.0-81.9) in the seven designated markets averaged 61.96 cents per pound for the week ended Thursday, June 16, 2016. The weekly average was down from 63.49 cents last week, and 62.39 cents reported the corresponding period a year ago. Daily average quotations ranged from a high of 63.21 cents Friday, June 10 to a low of 61.04 cents Wednesday, June 15. Spot transactions reported in the Daily Spot Cotton Quotations for the week ended June 16 totaled 3,302 bales. This compares to 4,805 bales reported last week and 1,037 spot transactions reported the corresponding week a year ago. Total spot transactions for the season were 1,461,648 bales compared to 2,078,699 bales the corresponding week a year ago. The ICE July settlement prices ended the week at 63.30 cents, compared to 64.96 cents last week. The Department of Agriculture’s Commodity Credit Corporation announced a special import quota for upland cotton that permits importation of a quantity of upland cotton equal to one week’s domestic mill use. The quota will be established on June 23, 2016, allowing importation of 14,671,661 kilograms (67,386 bales) of upland cotton. Quota number 19 will be established as of June 23, 2016, and will apply to upland cotton purchased not later than September 20, 2016, and entered into the U.S. not later than December 19, 2016. The quota is equivalent to one week’s consumption of cotton by domestic mills at the seasonally-adjusted average rate for the period February 2016 through April 2016, the most recent three months for which data are available. Future quotas, in addition to the quantity announced, will be established if price conditions warrant. Spot cotton trading was slow. Supplies were light. Demand was light. Average local spot prices were lower. Trading of CCC-loan equities was inactive. Widespread thunderstorms brought moisture to areas across the entire Southeastern region during the period. Areas throughout south central Alabama recorded the heaviest precipitation totals with measurements from 3 to 5 inches, and heavier downpours observed in localized areas. Much of the Pee Dee region of South Carolina and coastal North Carolina received around 2 to 3 inches of moisture during the period. Elsewhere across the Southeast, sporadic storm activity brought trace amounts to around 2 inches of moisture to areas from the Gulf coast to portions of south Virginia. Despite the scattered moisture, hot and sunny conditions dominated the weather pattern with daytime highs in the upper 90s. The crop made good progress under the ideal weather and planting was winding up across the region. The crop varied from just planted to blooming in the earliest planted fields in the lower Southeast. Squaring was underway and field scouts were monitoring plants for square retention. Sprays were applied to treat fields that met threshold limits for plant bugs, stink bugs, and spider mites; local experts were reminding producers to be mindful when selecting insecticides to treat multiple pests. In the Carolinas, producers were finishing up treatments for thrip infestations, and reports indicated the recent moisture has helped to manage damage from this pest. According to the National Agricultural Statistics Service, the crop conditions were rated mostly fair-to-good across the region. Clear skies and hot temperatures characterized the weather pattern during the period. Occasional pop-up thunderstorms brought some moisture to isolated locales. Up to 2 inches of precipitation was recorded in some places; most areas remained dry. Severe thunderstorms, characterized by damaging winds of up to 60 miles per hour and marble-sized hail, moved through the region mid-period. No damage to crops was reported. Daytime temperatures were in the 90s with heat index values pushing into the high 100s. A heat advisory was in effect for most of the region late in the period, as a result of high temperatures combined with high humidity. Overnight lows were in the mid-70s. Producers continued to apply herbicides to combat Palmer Amaranth, or pigweed. Insect pressure from plant bugs was light, but building; fields were treated as needed. The crop responded well to the hot weather and made excellent progress under favorable conditions. Producers were irrigating in areas that received scant rainfall. According to the National Agricultural Statistics Service (NASS) Crop Progress report for the week ending June 12, cotton squaring was reported to have reached 35 percent in Arkansas, 16 in Missouri, and 15 percent in Tennessee. NASS also reported that the crop was in fair-to-good condition. mid-period. Up to 3 inches of precipitation was recorded in places that received the brunt of the storms; a few areas remained dry. Daytime temperatures were in the 90s with heat index values pushing into the high 100s. A heat advisory was in effect for most of the region late in the period, as a result of high temperatures combined with high humidity. Overnight lows were in the mid-70s. Insect pressure from plant bugs and spider mites was light. The crop responded well to the heat and made excellent progress under good conditions. Producers were irrigating fields that did not receive any beneficial rainfall this week. According to the National Agricultural Statistics Service (NASS) Crop Progress report for the week ending June 12, cotton squaring was reported to have reached 13 percent in Louisiana and 17 percent in Mississippi. NASS also reported that the crop was in fair-to-good condition. Spot cotton trading was inactive. Supplies, producer offerings, and demand were light. Average local spot prices were lower. Trading of CCC-loan equities was inactive. Foreign mill inquiries were moderate. Interest was best from India, Mexico, and Pakistan. Thunderstorms brought more than 5 inches of heavy rainfall in localized areas of the Blackland Prairies, which caused fields and roadways to flood. Fields were not accessible early in the reporting period, and damage assessments continued. Southern Texas also received light to moderate rainfall, with the heaviest amounts around 4 inches in the Upper Coastal Bend. Fields progressed in the Rio Grande Valley under hot, sunny conditions. The first 2016-crop cotton was harvested and delivered to the gin. In Kansas, planting continued. Producers aggressively managed weed populations. In Oklahoma, planting was delayed because of thunderstorms that left most fields saturated. The moisture was beneficial and helped early seedlings germinate. The planting deadline is June 20. Dryland stands varied in progress from newly emerged to 2 true leaves. Irrigated stands were further advanced at 4 and 5 true leaves. Some producers planted in the wheat stubble of fields that had recently been harvested. Spot cotton trading was slow. Supplies, producer offerings, and demand were light. Average local spot prices were lower. Trading of CCC-loan equities was inactive. Foreign mill inquiries were moderate. Interest was best from India, Mexico, and Pakistan. Young cotton stands advanced under warm, sunny conditions. Progress varied from emergence to 6 true leaves. Some stands were close to squaring, according to local experts. Thunderstorms brought heavy rainfall on June 12 and the evening of June 15. The moisture was quickly absorbed into the soil profile. Hail damage was reported as extensive on limited acres. Fieldwork was active as weed management continued both manually and through chemical treatments on conventional fields. Plant pests were monitored, but many populations were controlled by recent rainfall. Spot cotton trading was inactive. Supplies and demand were light. Average local prices were lower. No domestic mill activity was reported. Foreign mill inquiries were light. Daytime high temperatures were slightly below average in the period for cotton-growing areas of Arizona and provided a break for the crop after extreme temperatures the previous period. Blooming and boll development advanced in Yuma. Irrigations began in central and Safford, Arizona. The crop made good progress. Crop vigor increased as temperatures steadied into the mid-to-high 90s in New Mexico and El Paso, Texas. First irrigations were underway. No significant pest issues were reported. A light amount of acreage was planted last week. No moisture was recorded in the period in the DSW. San Joaquin Valley (SJV) Spot cotton trading was inactive. Supplies and demand were light. Average local prices were lower. No forward contracting or domestic mill activity was reported. Foreign mill inquiries were light. Below-normal temperatures were welcomed after last week’s triple-digit heat. A storm system entered the area and brought little precipitation, but strong winds. Snowfall was recorded at elevations 10,000 feet and higher in the northern and central Sierra Nevada Mountain range. The crop made good progress. Little to no insect pressure was reported. Spot cotton trading was inactive. Supplies of 2014-crop were moderate, but light for 2015-crop. Demand was light. Average local prices were steady. No forward contracting or domestic mill activity was reported. Foreign mill inquiries increased for 2016-crop cotton. Shipper prices were firm. Interest was best from India and Peru. Over 40,000 bales of 2016-crop cotton were committed to export sales for week ending June 9, compared to 1,900 bales last year, according to the Foreign Agricultural Service. A low pressure system entered the region early in the reporting period, and moderated temperatures in the Far West. The crop made good progress. No significant insect pressures were reported. Irrigations, herbicide applications, and tillage of fields were on-going. Domestic mill buyers purchased a moderate volume of color 41, leaf 4, and staple 35 for August through October delivery. Demand was good for 2016-crop cotton, color 41 and 42, leaf 4 and 5, and staple 33 and longer for November 2016 through March 2017 delivery. No additional sales were reported. Yarn demand had slowed and finished product business was lackluster. The undertone from most mill buyers was cautiously steady. Most mills operated four to seven days. Demand through export channels was moderate. Indonesian mill buyers purchased a moderate volume of color 41, leaf 4, and staple 35 for nearby shipment. Agents for mills in Vietnam inquired for a moderate volume of color 52, leaf 5, and staple 35 for nearby shipment. 80-82 sold for around 60.00 cents per pound, FOB car/truck (Rule 5, compression charges paid). Mixed lots containing color mostly 43 and 52, leaf 4-6, staple 36 and longer, mike 43-49, strength 28-31, and uniformity 80-82 sold for around 54.50 cents, same terms as above. In Texas, a light volume of color 42, leaf 3 and 4, staple 35, mike 43-52, strength 29-32, and uniformity 80-82 sold for around 57.00 cents per pound, FOB car/truck (compression charges not paid). A light volume of color 32 and better, leaf 3 and 4, staple 33 and longer, mike 42-53, strength 24-36, and uniformity 76-83 sold for around 51.00 cents, same terms as above. In Kansas and Oklahoma, a mixed lot containing a moderate volume of color 43 and better, leaf 3-5, staple 34 and longer, mike 31-53, strength 25-33, and uniformity 76-82 sold for around 52.50 cents, same terms as above. West Texas A mixed lot containing a light volume of mostly color 31-41 and 32-42, leaf 3-5, staple 36 and longer, mike 34-46, strength 28-33, uniformity 79-83, and 50 percent extraneous matter sold for around 60.00 cents per pound, FOB car/truck (compression charges not paid). Mixed lots containing a moderate volume of mostly color 31 and 32, leaf 3 and 4, staple 35, mike 35-50, strength 28-33, and uniformity 78-81 sold for around 59.50 cents, same terms as above. A light volume of color 31 and 41, leaf 3 and 4, staple 34 and longer, mike 33-40, strength 25-31, and uniformity 75-78 sold for around 56.25 cents, same terms as above. A light volume of 2016-crop cotton for contract base quality color 31, leaf 3, and staple 35 and longer was contracted at around even on ICE December futures early in the reporting period. These contracts were subject to government discounts with 200 points premium paid for qualities better than the contract base quality. 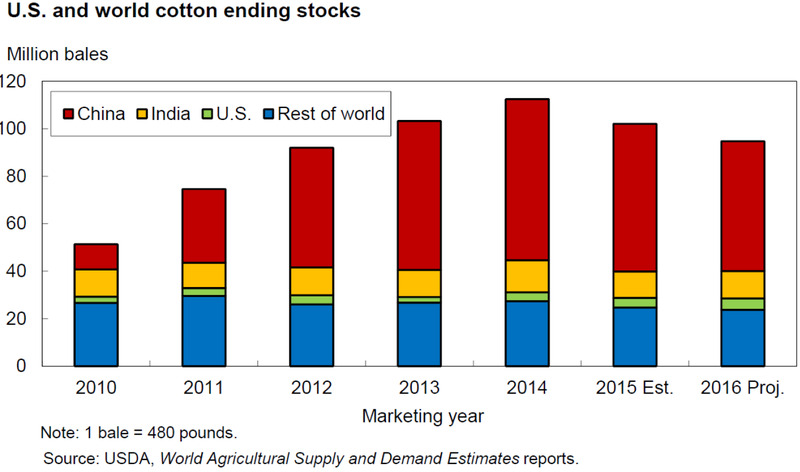 Global cotton stocks reached a record 112.5 million bales in 2014/15, largely due to government policies in China that supported growth in China’s reserve stocks. Since then, policies to reduce the surplus were implemented, and stocks in China, as well as global supplies, have declined. Although they remain projected at relatively high levels, stocks in China at the end of 2015/16 are estimated at 62.3 million bales—a decline of 8 percent from 2014/15—accounting for 61 percent of world stocks. A further decline is also projected for 2016/17, when stocks in China are forecast at 54.7 million bales; these stock levels and China’s 58-perecent share of the world total are projected to be at their lowest in four seasons.